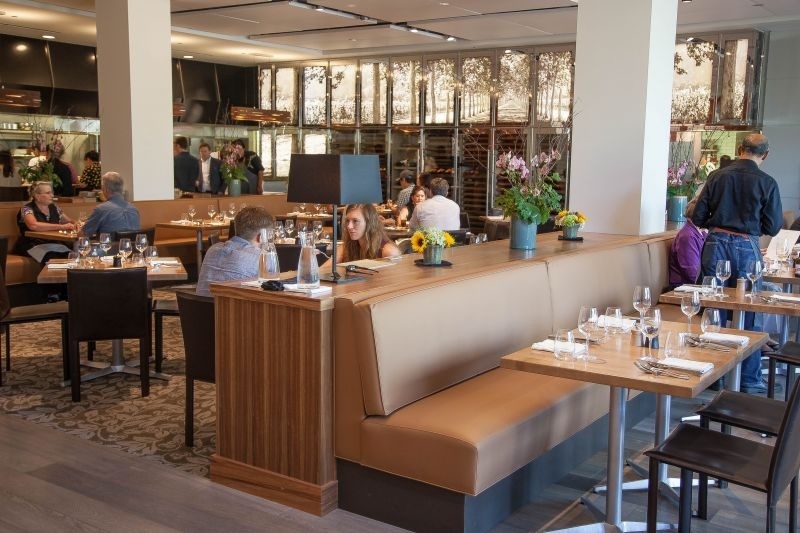 We were very excited to visit the brand new CIA at Copia Restaurant in Napa. I had been watching people on my news feed rave about the food for weeks before we finally got the opportunity to go with our regular group of blog diners to taste the deliciousness for ourselves. 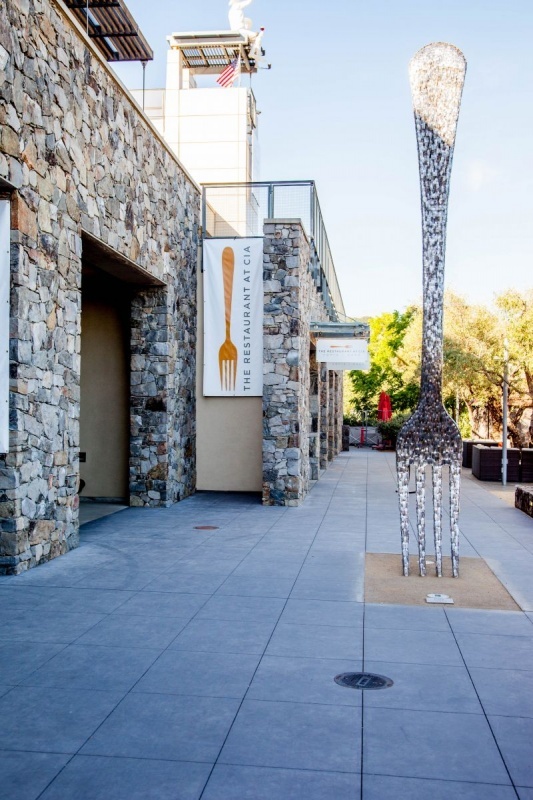 Coming in from the parking lot you will see a giant fork sculpture welcoming the guests. What may not be apparent is the figures sitting on top of the building, looking down on all who enter. 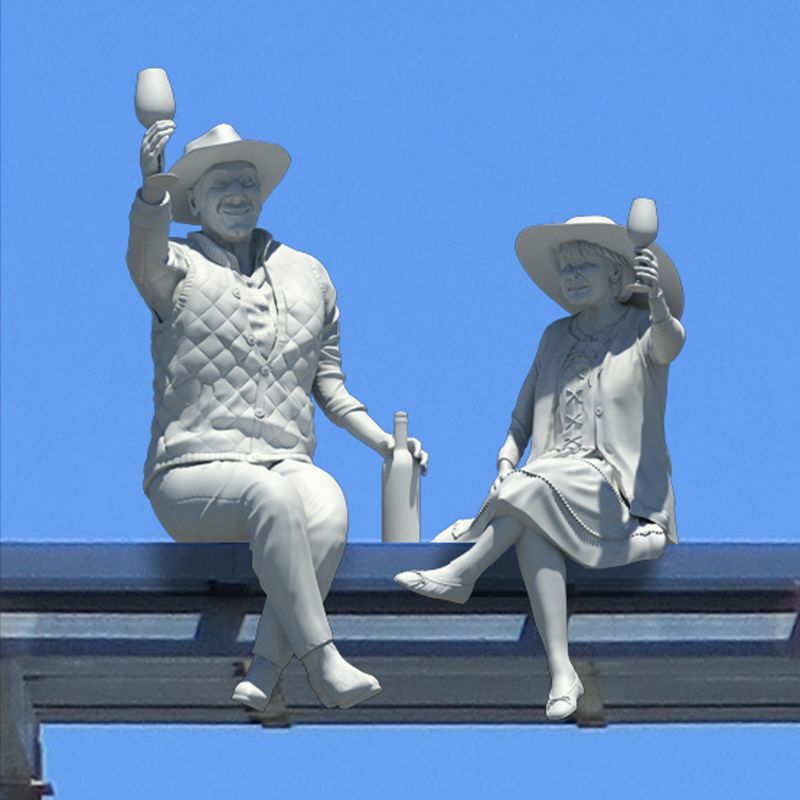 I love the whimsical nature of the statues. It put me in a good mood. 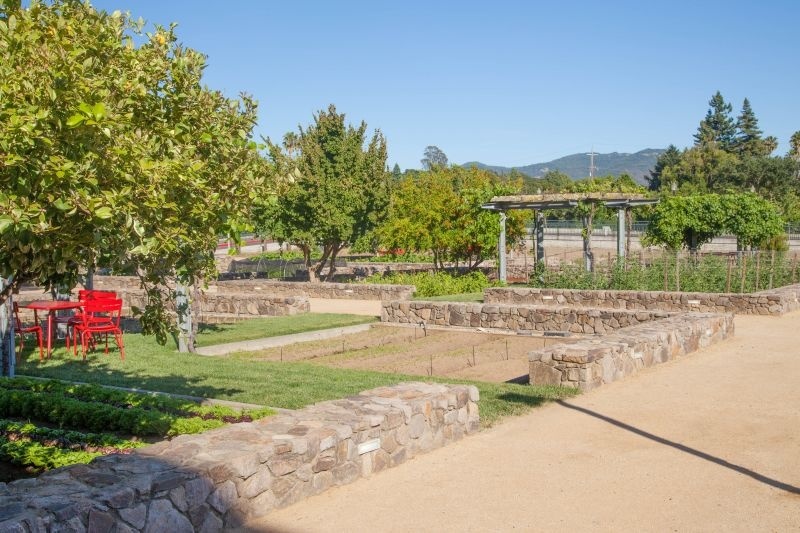 The area also sports a chef’s garden and an outdoor dining space. I really liked being able to see the food grown right outside the kitchen as you dine. 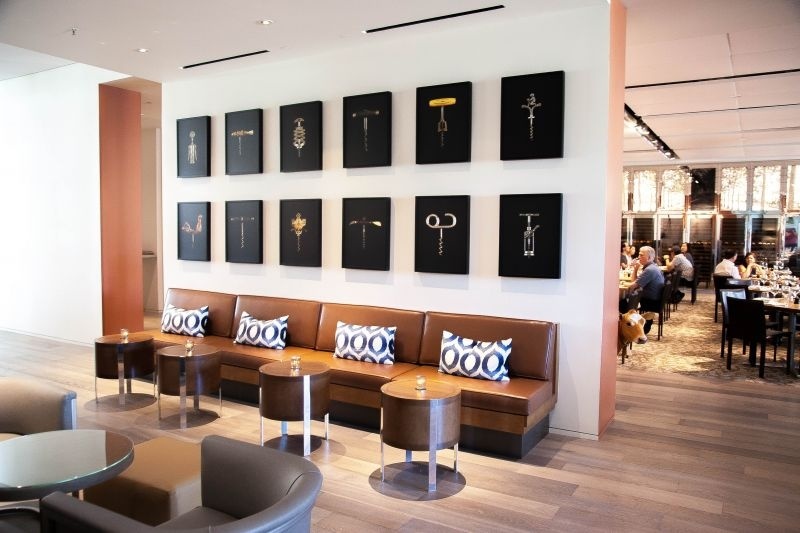 The restaurant and lounge are spacious and open. There are huge picture windows at the end of the restaurant which allows in natural light plus a lovely view out onto the gardens. 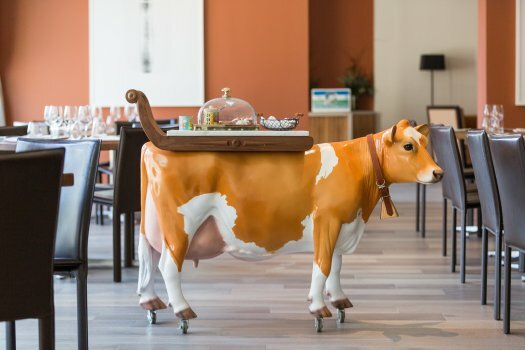 They have tried to keep a small bit of humor and playfulness amongst their decor which is highlighted by the cow cart they use to serve the cheese course. To start we ordered a combination of appetizer dishes. 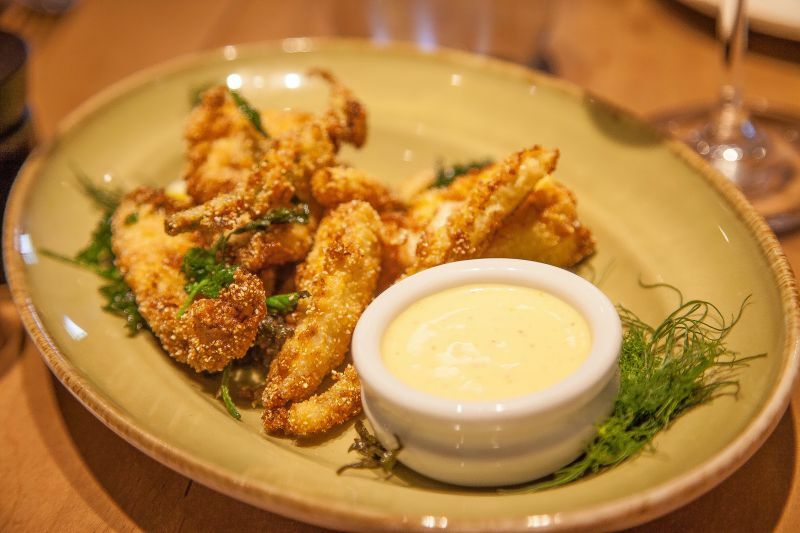 Chicken wings, Asparagus spears topped with shaved parmesan and proiscutto and fried heirloom green tomatoes. The chicken wings were both interesting and delicious. They were actually spiced and then coated in cornmeal rather than bread crumbs or panko. I really liked the way that it took the texture level up a notch. We all gave them the thumbs up. 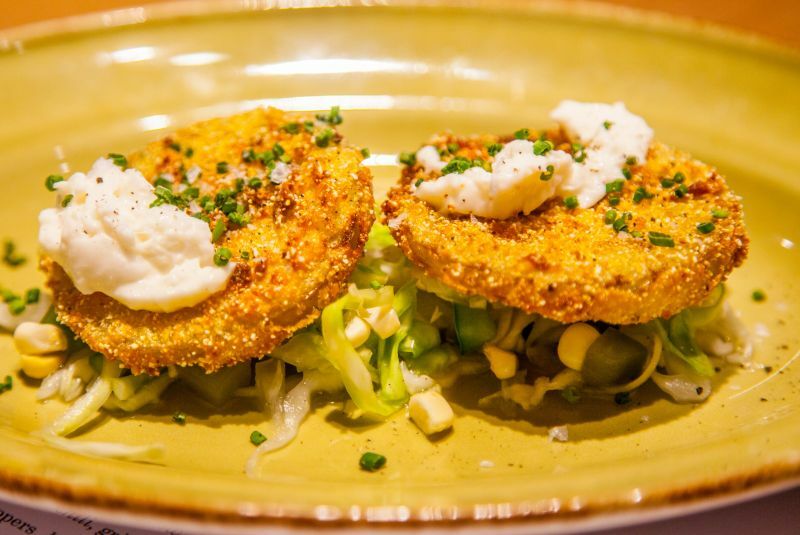 The heirloom fried green tomatoes were also a hit among our group. Using the same cornmeal coating as the wings with just a hint of kick, I really loved my bites of the dish. The tomatoes were perfectly cooked, tender and flavorful and were served on top of a fresh coleslaw. The asparagus was simple and tasty and I have to say I loved the combination of flavors. It was time for our main courses. 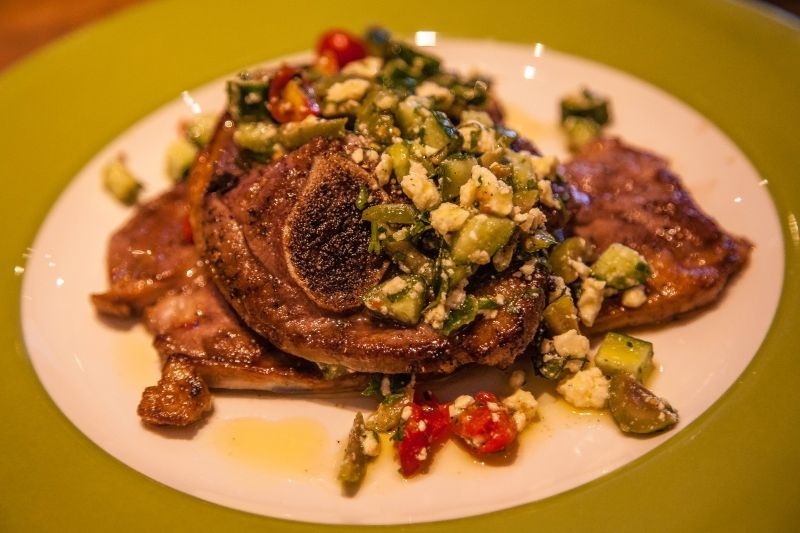 One of our dining companions ordered the lamb chops that were covered in zucchini, feta cheese, olive oil, tomatoes, and mint. The meat was both beautifully cooked and seasoned – a real winner. 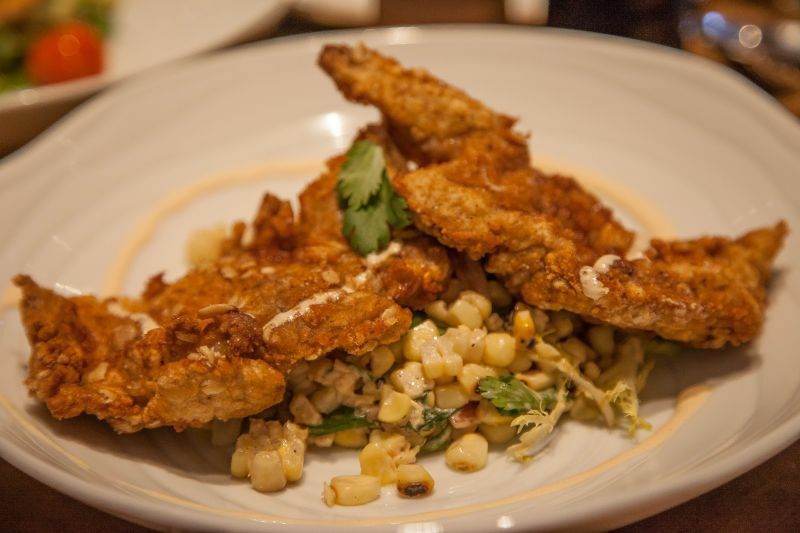 The next dish was a buttermilk fried quail on a bed of corn succotash. It was a very delicious and interesting combination. This was my dish, and I ordered it simply because it was so unusual and I couldn’t figure out how they would do it. I loved the flavors, and I thought the corn succotash was the perfect complement to the plate. 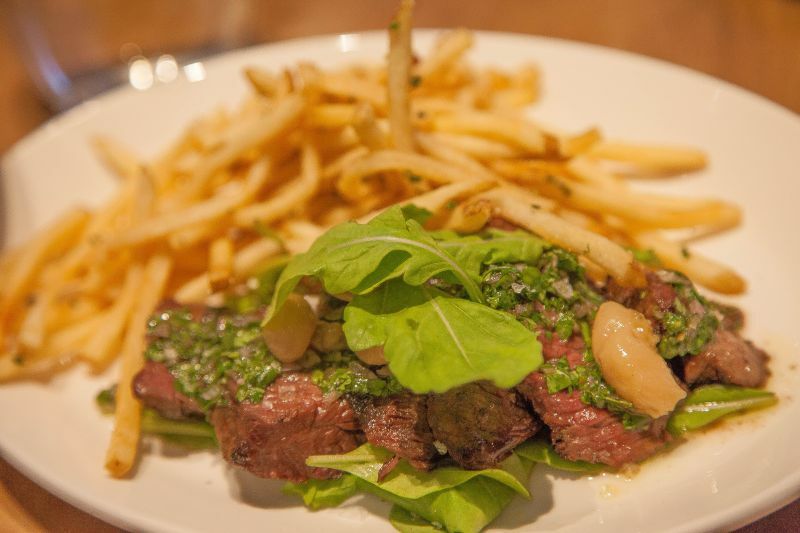 The Brit was true to form and ordered Hangar Steak with chimichurri and a side of fries. It was cooked a perfect medium rare and looked great on the plate. I had a bite and it was delicious! 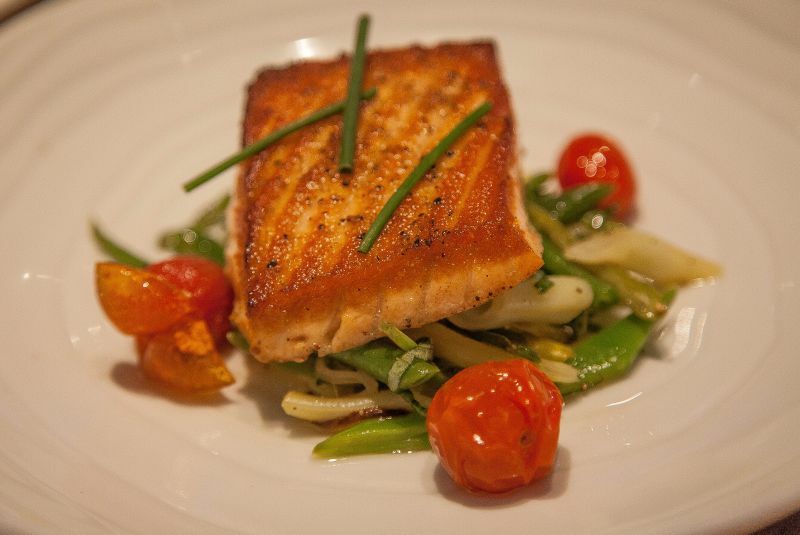 The final main dish was pan-seared salmon on a bed of seasonal vegetables. That got raves from our guest who ordered it. I had a bite, and the salmon had great flavor and crunch without being overcooked. Wonderful! 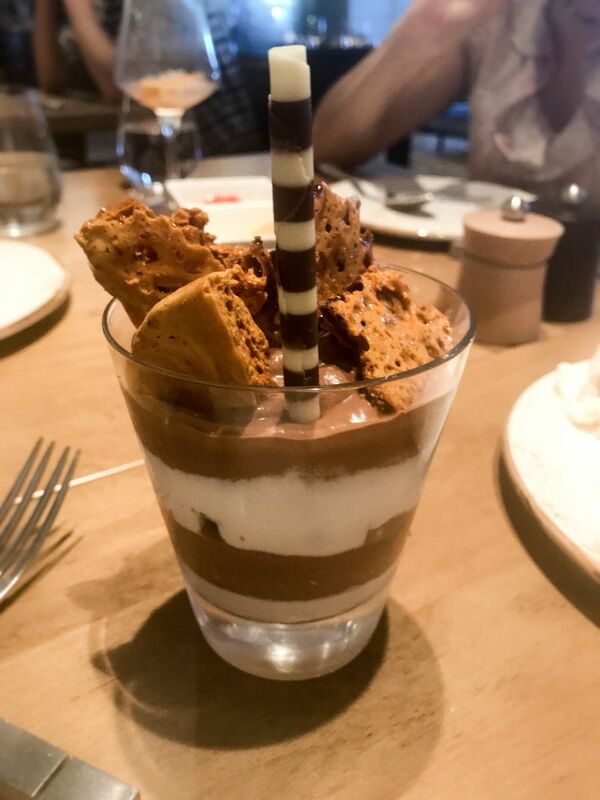 Dessert was a layered white chocolate and milk chocolate mousse with burnt honeycomb crumbles and a chocolate straw. I didn’t care for the flavor of the honeycomb, it simply tasted like sweet burnt crispy stuff. The mousse had good flavor and texture but I didn’t think it was wonderful. I have to tell you as good as this meal was, the service and attention to detail just weren’t there. Several of our dishes came out wrong or were forgotten completely. Our drinks weren’t refreshed, and honestly, it was a little sloppy. Despite several of our dishes being “comped” for being served incorrectly, late, or not at all, our bill was around $90 per person which included one glass of wine or cocktail each. I was disappointed because, at this price point, I really expect better quality from the kitchen and the service. 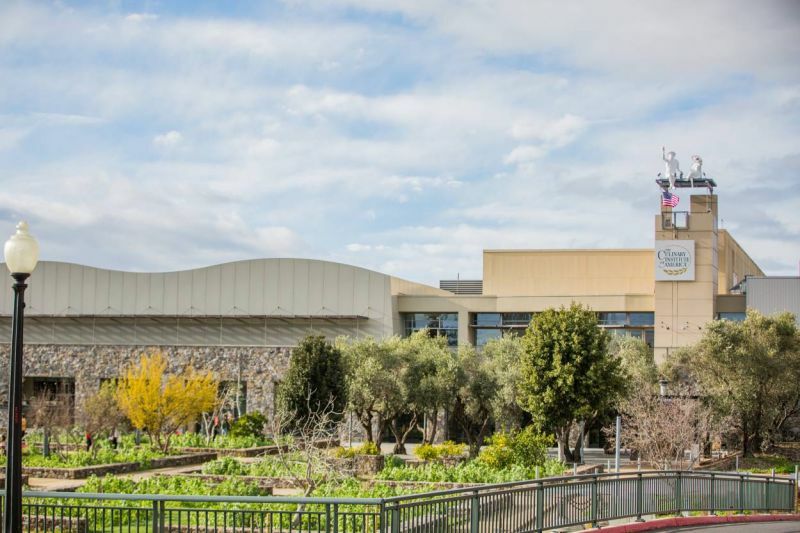 Would I recommend eating at CIA Copia Restaurant? Hmm, this is a hard one. I liked the food I ate when and if I got it, and I liked the restaurant atmosphere in general. I would suggest waiting a few more months until they work out a few more of the kinks and get the new executive chef truly on board before trying it. Great post, guys. We had the same experience into visits to this restaurant. The food was solid, but the service was really sub par. The good news is the restaurant has a new chef, the amazing Polly from Ciccio. I know she is aware of some of the front of house issues, and I would expect them to improve quickly. Yes, I read about her joining the team. I really hope that she sorts it out. It could be a jewel of a restaurant. Thanks for your comment John! Hey guys, another great post. We had the same experience on two separate visits. The service was really not great, and they forgot to bring my entrée the first time. They do have a new chef, the one that used to be a Ciccio, and I’m expecting the things below.